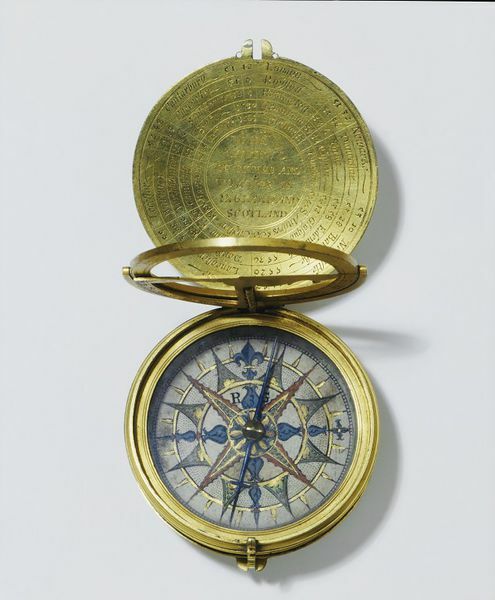 This compass-dial was used to tell the time during the day and also at night. In daytime, the hours are indicated by a sundial. The scale on the quadrant attached to the sundial's gnomon, or pointer, is first set to the correct latitude. The whole dial is then turned until the compass needle points to north on the compass card. In sunlight, the shadow of the gnomon will then indicate the hour on the ring. At night, the pointer on the larger and lower of the two discs is set to the current date engraved on a scale on the back cover. The compass-dial is held up to the eye and the smaller disc rotated until the slot cut in it is aligned with the two 'pointer' stars in the Great Bear. A pointer on this disc will then indicate the hour on the large disc. The age of the moon, measured in days, and the position of the sun and moon in the zodiac are indicated by rotating discs and a pointer on the back of the case. This sophisticated astronomical instrument was made for James I (ruled 1603-1625) and is also thought to have been used by his son, later Charles I, when he was Prince of Wales. The compendium is signed by Elias Allen who was the most distinguished instrument maker of his day. He made the first slide rule and supplied mathematical instruments to the Stuart royal family.